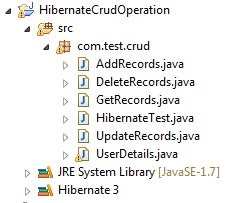 In this article we will learn how to perform crud operations in Hibernate in Java. Hibernate is used for Object Relational Mapping between database and Java class objects. It defines objects to communicate with database. These objects are used to create database tables and schemas and also perform database tables operations like CRUD operation i.e. 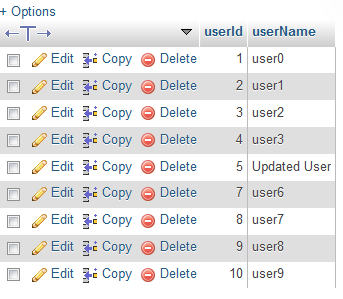 Create, Delete and Update table records. Above example defines a bean class object “obj” of “UserDetails” class and assign this object as an argument into save() method of “Session” class. get() method take two parameter, where first parameter take bean class object as an argument and second argument is the primary key record that is applied on the table as a where clause to fetch records from the database table. Above example defines a “UserDetails” bean class object and assigned it as first argument and second argument is primary key record that is applied as where clause condition on “UserDetails” database table specified using first argument of get() method. Above example calls a method delete() that accepts an object of UserDetails class. This object is assigned to UserDetails referenced data fetched from the database table according to specified primary key record. 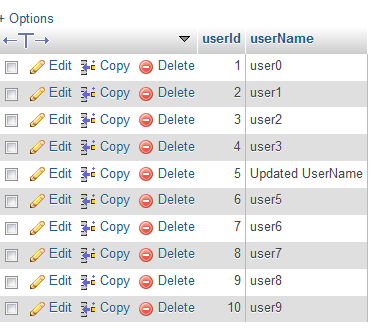 Above example access the data from the database table at primary key record “5” and update its data using its setter() method and now call method update() and assign this UserDetails bean class object as an argument. Let’s go with an example that performs CRUD operation using four different classes to perform these four actions with a bean class that creates a database table. Listing 1 defines a “UserDetails.java” java bean class that defines two class member variables as “userId” of integer type that is defined as a primary key of the database table and will be assigned to auto-generated values and “userName” of String type with its getter() and setter() methods. Listing 2 defines AddRecords.java java application class that defines a main() method. This method defines hibernate connection to communicate with database “MySql” using SessionFactory class and define a session using Session class. Once these configuration settings are done, create “UserDetails” bean class object inside “for” loop that loops for ten times and save each record into database table at the iteration of each loop. This record is being saved using save() method of the Session class. Once “for” loop terminates, session is closed using close() method of the Session class. Listing 3 defines GetRecords.java java application class that defines a main() method. This method defines hibernate configuration settings with “MySql” database and also defines a session object using Session class. This session object call a get() method of the Session class to fetch a record from the database table, this method accepts two arguments. 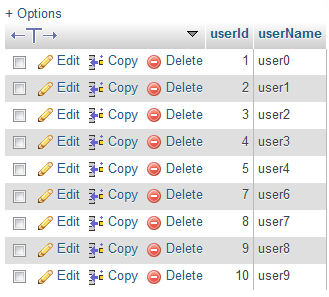 The first argument accepts the bean class (“UserDetails.class”) and the second argument accepts the primary key records that will match with the database table primary key record. Listing 4 defines a DeleteRecords.java application class that defines a main() method. This main() method defines a hibernate configuration setting for “MySql” database and also define a session object of Session class. This session object calls the delete() method of the Session class that accepts the bean class object as an argument and removes the record from the database table on the specified primary key record. Once the records has been removed from the database table, the session is closed using close() method of the Session class. Listing 5 defines a UpdateRecords.java application class that defines the main() method. This method declares hibernate configuration setting for “MySql” database and also defines session object of Session class. An update() method is called of the Session class using session object that accepts the bean class object (“UserDetails” class object) as an argument. The bean class object get the record from the database using the get() method and use the setter method setUserName() to update existing record of the database table. Figure shows the directory structure created by the Eclipse IDE for the hibernate application. In this article, we learn about the CRUD operations that are performed with hibernate. We also learned the way of defining CRUD operations. Session was used to define CRUD operation on hibernate in this article.